Served as Dean of the College from 28/10/1952 to 27/9/1954. -Received a Bachelor degree in Medicine and Surgery from Cairo in January 1928. -Received a bachelor degree in physiology from London University in June 1932. -Received a Ph.D. in physiology from the London University in July 1935. -President and member in 10 different scientific associations in Egypt, member in six foreign scientific associations. 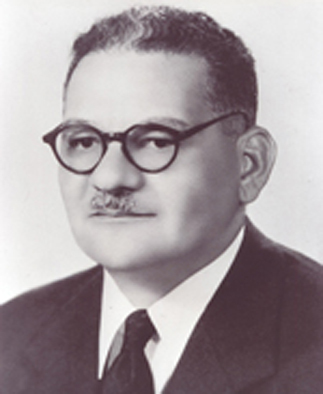 -He worked as a lecturer in Physiology Department in the Faculty of Medicine, Cairo University from 18/2/1928. -He worked as teacher in Cairo in June 1933. -He worked as teacher in Cairo in November 1938. -He worked as Physiology Professor in Baghdad Faculty of Medicine in April 1940.then he was appointed as Physiology Professor in Alexandria Faculty of Medicine in 1943, then as dean of the College in 28 October, 1952. then served as professor of Physiology II, Faculty of Medicine, Cairo University from October 1954 , worked as vice dean in Cairo University from October 1959 to January 1966 . During his reign, the college has witnessed great openness with a great management of the educational process .they follow the full day system of teaching lectures ;starting at eight in the morning and continue the daily work until after the fourth or fifth.